If you haven’t had your say on the exciting Master Plan ideas for Ellesmere Port then there is still a week left to get in touch. Cheshire West and Chester Council has been sharing the plans for the past month with drop in sessions around the town and a fixed display in the central library. Councillor Brian Clarke, Cabinet Member for Economic Development and Infrastructure said: “Thanks to the many people who have already visited the drop in sessions at Trinity Methodist Church, the Market and Port Arcades. “The plans can still be viewed until the end of November at the Central Library. 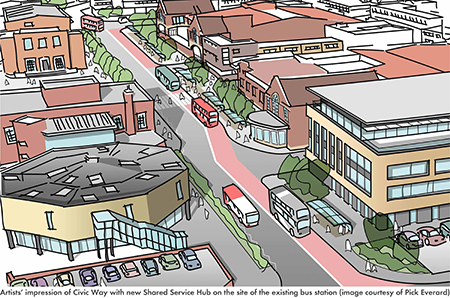 Our regeneration plans include a new Shared Services Hub located on the site of the existing bus station. We also want to bring together several health services to be based in the former TJ Hughes next to the bus station. “The bus stops would be moved to Civic Way, and the Civic Way Council office would become vacant, providing further redevelopment opportunities”. There has been a good response so far with ideas and comments about the four themes to strengthen the town centre, by focussing on the day time economy, transport and environmental quality, culture and evening economy, housing and community. From comments received so far, the market is proving to be popular with the people of Ellesmere Port and attracts visitors from surrounding areas. It has been suggested to make food and drink stalls more diverse instead of it being one large café, and a general call for a wider variety of shops and stalls in the Indoor Market. With regard to the Flea Market, various people suggested the space also to be used as a play area for children and as an activity and social meeting place for young people. Better pavements and more crossing points were suggested for Whitby Road and an improvement to the steps to the railway station. Extend parking space to area where ‘The Knot’ used to be or provide car access from Whitby Road. Other comments include: “I think we should have more houses and ground floor flats”, “Now Mecca bingo is gone there is nowhere to go at night for older people”. “With so much new housing, we need more school places, somewhere for teenagers to meet safely for social events”. “Civic Square is very bland at the moment, was better before it was improved needs to be an area where people can sit and chat with flower beds too”. The Council has secured £8m from the local Growth Fund to finance the delivery of the Shared Services Hub. Public service buildings in the area that are ageing and have become inefficient, and struggle to meet the needs of modern service delivery to local residents, will become development sites, once these services have moved into the new Hub, including the current Civic Way office. A short questionnaire is available to download or pick up at the Library that asks for opinions on the various proposals. Responses should be sent before Friday 30 November. For more details about the Master Plan visit: ellesmereportdevelopment.co.uk.